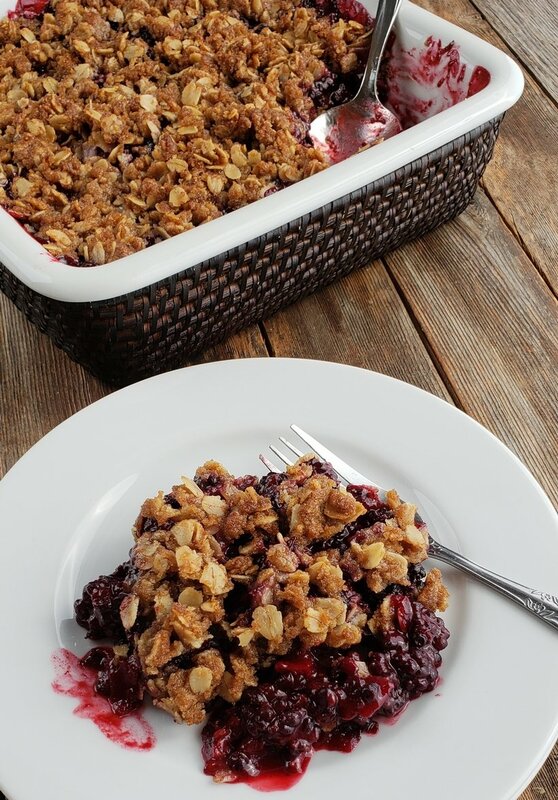 Nothing tastes more like late summer than a Blackberry Crumble. Even if you’ve never baked from scratch, you will find this recipe so easy to put together. Blackberries and any kind of berries grow prolifically here in Oregon. In fact, if you live in the Pacific Northwest, it’s almost a requirement to love blackberries. You can’t escape them as they are everywhere. The problem is, the vines are so invasive and can take over an area in no time at all. In all honestly, their thick, thorny, trailing vine branches are a nuisance and no one really wants them around. However, sometimes we have to make lemons out of lemonade. My neighborhood is covered in blackberry vines. There are so many, even the wildlife can’t keep up with eating all the fruit they produce. The blackberries growing on the side of the road are covered in dust and often left alone. This summer has been so unusually warm the blackberries are not only larger in size, but they are as sweet as sugar. We normally don’t see this type of ripeness until later in September. I have witnessed several homeowners out picking blackberries. Everyone seems to have their secret berry gathering location, including myself. The berries are so ripe and wonderful, I could stay out there all day and not get them all. Mine are also in a dust-free zone, which means I can just stand there and eat them as I pick. And trust me, I do just that. They are not as beautiful as the ones you’ll find in a market, but they taste ten times better. And hey, they are a lot cheaper this way. Adding sugar ensures sweetness, especially for the store-bought variety, while tossing with flour keeps the fruit filling from oozing all over your plate once it’s baked. The crumble topping is the second star of the show. Old-fashioned oats and dark brown sugar give the perfect contrast to the fruit. How perfect does this look? Not only is the color outstanding, it stays together nicely once served. Now, just imagine this topped with vanilla ice cream? It doesn’t get get better than that! 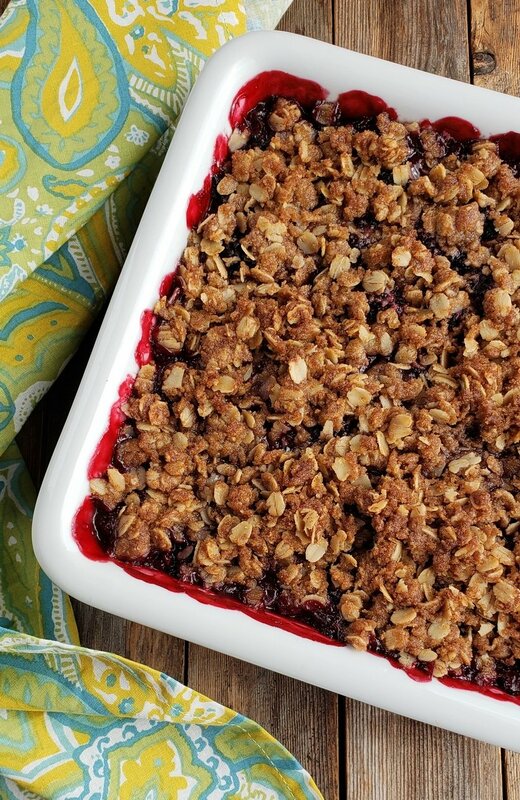 This Blackberry Crumble is going to be perfect at this year’s Labor Day barbecue. Other blackberry recipes you should consider making…these Blackberry-Banana Smoothies and Lemon-Blackberry Muffins. A Skinny Blackberry Margarita sounds like a great idea to me and so does Blackberry Ricotta Pizza with Basil. 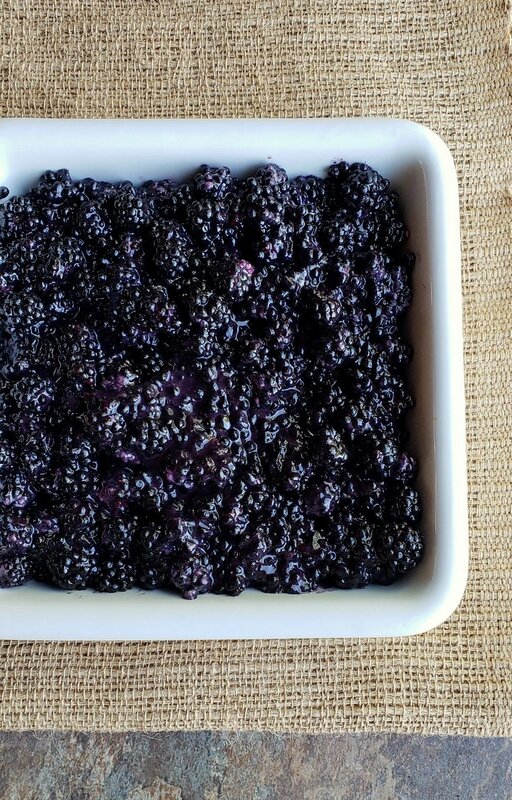 There are so many options when it comes to using up your stash of blackberries, including, making a glaze to put on salmon. Nothing tastes more like late summer than a Blackberry Crumble. Even if you've never baked from scratch before, you will find this recipe so easy to put together. In a large bowl, gently combine blackberries, sugar and all-purpose flour. Transfer to an 8 x 8 baking dish. 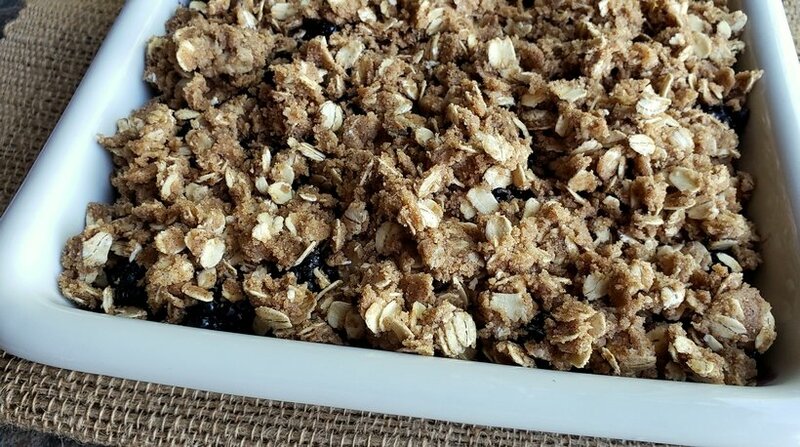 For the crumble topping, combine all ingredients in a medium bowl and work together with your hands until the ingredients resemble a crumble. Sprinkle the crumble topping over the blackberry mixture. 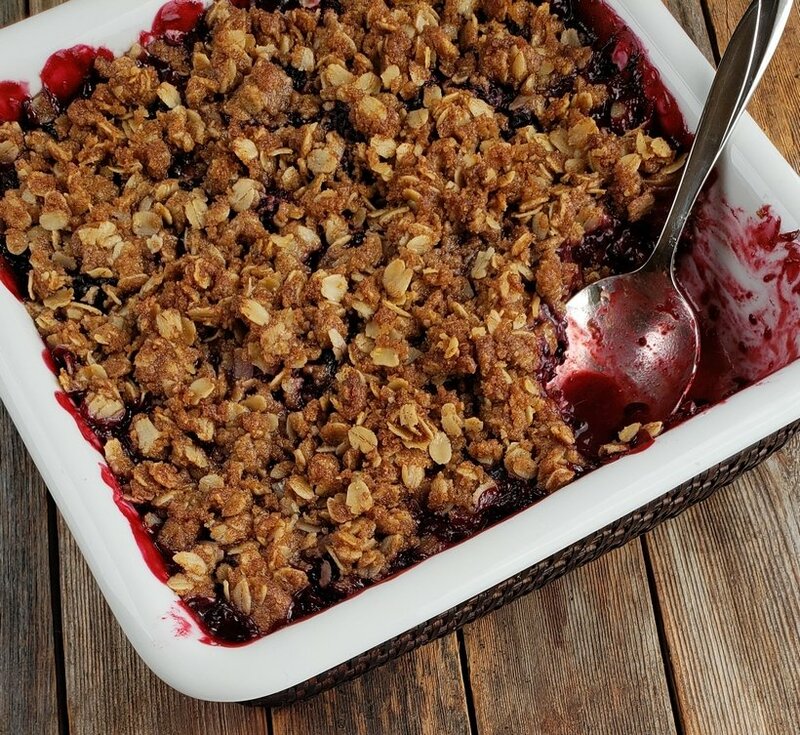 Bake crumble until the the topping is golden brown and blackberries are bubbling, about 40 minutes. Let cool for 15 minutes before serving. Serve warm or at room temperature, with ice cream if desired. Reading your post reminds me of the book “Where’d You Go Bernadette” where the overbearing neighbor complains endlessly about the unsightly blackberry bushes on the hill, so they are finally cut down and she gets her comeuppance when a rainy day brings a landslide into her living room. 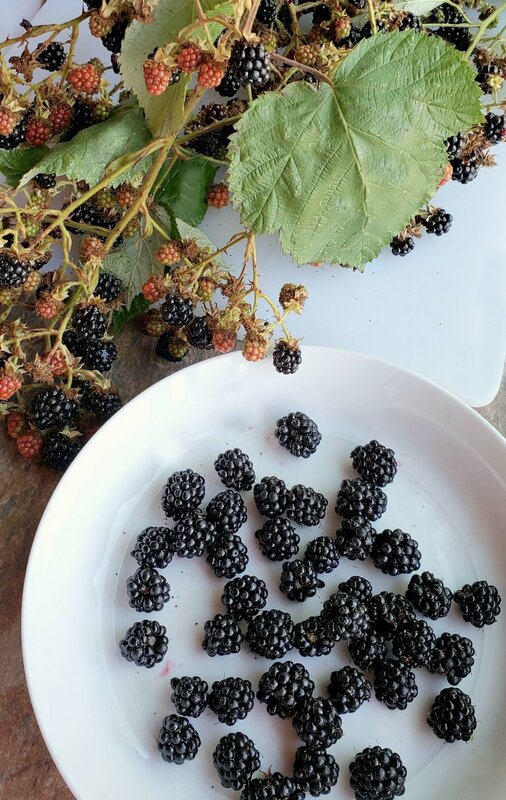 We have prolific blackberry bushes in the trails around my barn, but the season in short and there never seem to be enough ripe ones when I’m around. Fortunately I can get pretty good blackberries at the farmers’ market and desserts like this are the perfect way to use them. Haha. I mean they take over, if you let them. Your comment intrigued me enough to read the book! Very funny and loved the Seattle setting as I live in PNW. Favorite new term? Gnats! Lol. Just walked in the door from picking about a gallon of blackberries, growing on the back fence of the Warm Beach Community Garden I supervise…..and yes, this year they are extra sweet! I remember picking these growing up in Kansas, but out here in the Northwest they really take over don’t they? But you gotta love them, and pick them and do good stuff with them. Going to make this right away. Thanks for the recipe! I have already made jam and maybe I’ll do some syrup and have frozen a bunch for the northwest winter! That’s so great. Enjoy everything you make. Such a fantastic breakfast for these last days of summer. Soo yum! Hello gorgeous,bring on the vanilla ice cream! One of my all-time favorite desserts! The crumbly topping is calling my name! So wonderful with a big scoop of vanilla ice cream! Yep, that’s all it’s missing! That crumble on the top is perfect! I have to admit I’m envious of your fresh blackberries! 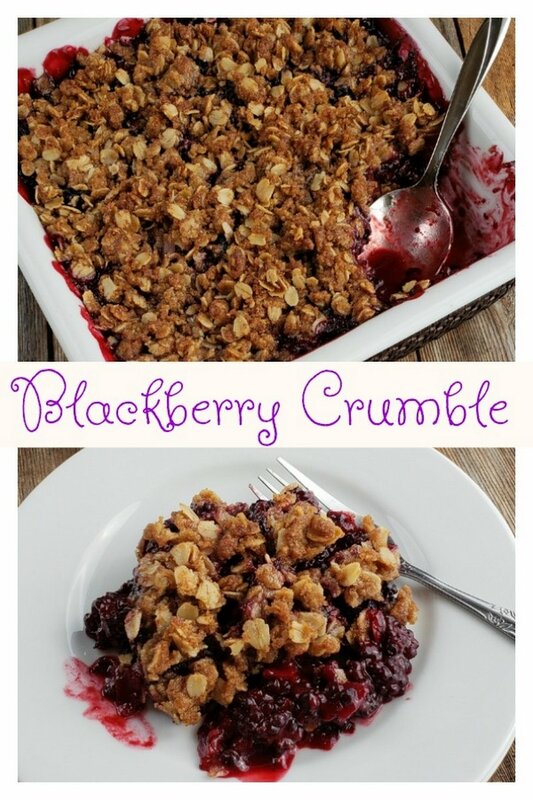 Your crumble looks irresistible! I’ll take mine with a scoop of vanilla ice cream. This looks heavenly, I want to try this with Dewberries next year! I don’t think I’ve had those. I need this in my life this summer! Can we use light brown sugar instead of dark brown? You can, just has less complexity.